An armored truck is a vehicle designed to securely transport currency and other valuables. Before the advent of armored vehicles, securely moving currency and valuables was achieved either by deceit or by force of arms. In the case of deceit, a courier in plain clothes would carry valuables disguised as a normal package or small piece of luggage. The courier traveled as a passenger on public means of transport, and although he was armed, his primary protection lay in appearing to be an average traveler. The main restriction of this method was size. In order to protect large shipments of valuables, man has long relied on a force of arms. Early caravans surrounded themselves with armed troops. Spanish galleons bristling with cannons carried treasure from the New World. In more modern times, stagecoaches carried locked but far from impregnable strong boxes of iron and wood, while a guard "rode shot-gun" to ward off thieves. Railroad mail cars were outfitted with safes and were guarded by heavily armed government troops. The failure of this method was always twofold. First, although cargo was relatively safe while in its large, protected vessel, eventually it needed to be placed in smaller, more vulnerable vehicles to be carried to its final destination. The second problem was that no matter how many soldiers, swords, rifles, or cannons guarded a travelling precious cargo, a larger force of thieves with more swords, rifles, or cannons could be rallied to steal the cargo. As weapons became dead-lier and more compact, this became more of a problem. The first attempts at commercial armored trucks were inspired by the combat success of military armored cars in World War I. After the war, a marked increase in violent robberies of payroll clerks and messengers carrying deposits brought about the need for safer ways to transport cash. In 1920, a Chicago area delivery company called Brink's started converting school buses into security vehicles by attaching steel plates to the lower body panels and barring the windows. Each bus was followed by a Model-T automobile filled with armed guards. The first true commercial armored car was built that same year in Minneapolis, Minnesota, for a St. Paul police chief turned private detective Mike Sweeney. Sweeney designed the car and put it into service for his Sweeney Detective Bureau. Early armored cars only wore steel plating on their body panels; they retained the wooden floors of the truck chassises on which they were built. This ended in 1927 when thieves buried explosives in the road and blew up a Brink's truck carrying $100,000 in payroll money. In the 1930s and 40s, manufacturers experimented with aluminum, which has a distinct weight advantage over steel. The metal was found to fatigue and crack after a short time and was discontinued. The 1970s worldwide fuel shortage spurred manufacturers to try lightweight plastic armor and smaller, more fuel-efficient chassises, but the results were similar to those with aluminum and the traditional steel regained its dominance in the industry. The material that makes up most of an armored car is also what makes it armored. An armored car is basically a large, sealed metl box and is thereby very hot inside. The windows do not roll down for obvious reasons, so most trucks have four roof vents with a baffle to obstruct any direct lines of fire into the truck. The gun ports installed in each door employ a spring-loaded plate that must be slid open from the inside to prevent assailants from using them to fire into the vehicle. The walls, floor, ceiling, and doors of an armored car are all made from steel. In recent years, both galvanized and stainless steel have been used to combat body rust and corrosion. The steel is hardened to increase its bullet resistance, either by heat treatment or by adding high levels of chromium (a very hard metal) and nickel (a very dense metal) during the forging process. In some applications, a ballistic fiberglass cloth known as woven roving is used to line the interior of the body. The windows of the truck are either made up of several layers of automotive glass or of layers of glass mixed with layers of bullet-resistant optical plastic. Four equally important goals must be considered in the making of an armored truck, several of which work against each other. The first consideration is ballistic resistance. Manufacturers use hardened steel in thick-nesses varying from 0.125 in (0.317 cm) to greater than 0.25 in (0.635 cm), depending on the level of resistance required to build most of the body of an armored truck. Windows are made bullet resistant by using laminated glass in thicknesses between 1.50 in (3.81 cm) and 3 in (7.62 cm). Utilizing a mixture of glass and bullet-resistant optical plastic allows a much thinner and lighter window. Windshields are placed at a 45-degree angle to aid in deflection and to lower wind resistance. Tires are armored with a u-shaped hard plastic liner. If a tire deflates, it can run for several miles on the structure of this shell. Steel ram bumpers and front grill guards allow a driver to push through another vehicle that may be used as a roadblock. Increasing a truck's level of ballistic resistance means increasing the thickness of the steel and glass used and this works against the second design consideration—weight. Gross Vehicle Weight (GVW) measures the maximum a motor vehicle can safely weigh, including its cargo and passengers. The average GVW for a "route truck," which makes everyday pickups and deliveries for banks and merchants, is 25,000 lb (11,350 kg). The average finished route truck weighs 12,000 lb (5,448 kg). This leaves 13,000 lb (5,902 kg) for cargo and guards. Reducing the finished weight of a truck allows for greater cargo weight. Decreasing the amount of armoring is not an attractive option, so trucks that need to haul heavier cargo, such as coins, must be built on larger, heavier chassises. A tandem-axle truck designed to haul large pallets of coin can have a GVW upwards of 55,000 lb (24,970 kg). The third design consideration is security. Clearly, bullet resistance is of little use if the truck's operators and cargo are not securely separated from the outside world. With this in mind, security measures are aimed at installing and maintaining barriers. Most armored cars operate with two armed guards—a driver, who never leaves the vehicle, and a second guard known as a hopper, who rides in the cargo hold and carries valuables to and from the truck. The driver's compartment is separated from the cargo area by a steel bulkhead. The doors through which the hopper travels are fitted with slam locks, which automatically lock when the door swings shut. Once these doors are locked, the driver must reopen them electronically from the inside. Inside the cargo area, the hopper may place valuables inside a locked box, or he may use a drop safe, which has a one way chute and can only be opened once the truck has returned to its home facility. The gun ports installed in each door employ a spring-loaded plate that must be slid open from the inside to prevent assailants from using them to fire into the vehicle. The security requirements necessitate additional steps to accomplish the final design goal—crew comfort. 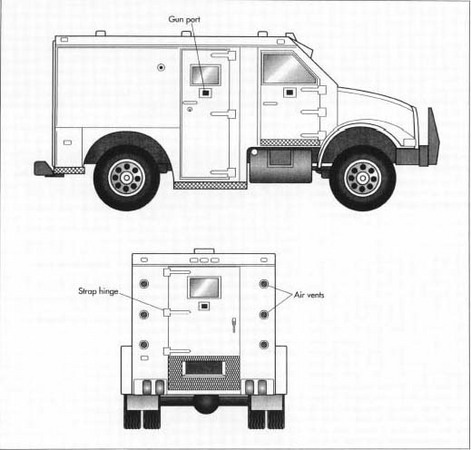 An armored car is basically a large, sealed metal box and is thereby very hot inside. The windows do not roll down for obvious reasons, so most trucks have four roof vents with a baffle to obstruct any direct lines of fire into the truck. Trucks are also fitted with dual air-conditioning and heating units, so the hopper and driver can independently adjust temperatures. The walls, ceiling, and floor of the cargo area are lined with light-weight foam-board insulation to further regulate inside temperatures. 1 The production of an armored car begins with the delivery of a bare heavy duty truck chassis. The chassis arrives with complete drive train (engine and transmission) and suspension systems. Some manufacturers take delivery of a chassis with a full cab, which they cut off. Then they reuse many of the interior pieces. Others use a cowl chassis, which only arrives with fenders and a hood. 2 The body of an armored truck is built much in the same way a house is framed. First, sections of square steel tubing are laid out vertically on a table known as a jig that represents the shape of an individual wall. Then lengths of steel channel called hat rails (because the cross section resembles a flat-brimmed hat) are laid horizontally at specific intervals across the vertical sections of tubing and tack-welded to hold them in place. Shortened sections of tubing and hat rail are used in certain areas to leave spaces that will become windows and doors. The process is repeated on the appropriate jig for each wall and for the roof, floor, and bulkhead. 3 Meanwhile, large sheets of hardened steel are being formed into outside body panels. The sheets are first cut to the correct size by enormous hydraulic shears. The cut panels are then rolled onto a table where the openings for windows and doors are cut with high temperature plasma torches. Some manufacturers employ welders to operate the torches, while some use computer-controlled robotic arms to handle the cutting. With this robotic system, plans are drawn on a computer; the computer then instructs the robotic arms to cut the exact shapes and dimensions to match the plans. The robotic arms slide vertically along an overhead track to accomplish vertical cuts, while rollers in the cutting table slide the steel across the path of the torch to handle horizontal cuts. The panels are then rolled onto various hydraulic presses where the necessary curves and angles are formed. Once the steel has been cut and formed into its appropriate shape, it is fitted against its corresponding frame and welded or riveted in place. 4 The floor is the first structure to be lifted onto the waiting chassis. First a sheet of hardwood is placed on the chassis' frame rails to insulate against vibration. Then the floor is placed on the hardwood and is attached to the chassis at several points with a number of c-shaped clamps. The walls are then each lifted onto the chassis and are tack welded or temporarily clamped where they join the floor and where their corners meet. Then the roof is placed on top of the walls. Once the entire structure has been checked for straightness and fit, all the joints and seams are thoroughly welded or riveted. 5 Now that the body has been given its structure, the pieces that will make it a functioning armored truck are put in place. First, hinges are bolted to the door frames and the doors are hung and adjusted for straightness. Armored truck doors are hung on strap hinges, which extend horizontally across the face of the door to support the weight of the armoring. The hinges contain sealed grease fittings to allow the doors to swing smoothly. 6 Next, foam-board insulation is pressed into the spaces between the steel tubing of the body panels. Then an interior sheet of steel is welded or riveted to the tubing. Some manufacturers use a fiberglass ballistic cloth called woven roving in place of the interior steel lining. Layers of woven roving are infused with an epoxy and placed into a mold in the shape of the interior panels of the truck. The layers are pressed together in the mold and when dry, form a solid piece. 7 Once the interior has been lined, the bulkhead separating the cab from the cargo area is fastened in place. Then any shelves, bins, and safes are installed in the cargo area, and the vents are attached to the roof and the gun ports are fitted into the doors. 8 The first step in creating a finished armored truck is to grind down any rough or irregular welds and to seal any seams with caulking. Then the interior is primed and painted, and the exterior is sprayed with numerous layers of sealant and primer before being painted to the customer's specifications. 9 Once the paint is dry, the electricians wire the truck (all wire in an armored truck is run through exposed conduit for ease of maintenance), and the heating and ventilation engineers install the rear air conditioning and heating unit. Next, the glass is installed; the locks are installed; the mirrors, bumpers, running boards, and grill guards are attached. The interior soft trim such as seats and belts, visors, and door handles are replaced last to avoid damage while other work proceeds. Finally, the finished truck is driven to a separate paint booth and the entire underside is sprayed with a corrosion resistant undercoating. Surprisingly, the first part of an armored truck to need replacing is the chassis. The added weight of the armoring plus the weight of the cargo shortens the lifespan of the truck's suspension, braking, and mechanical systems. The steel body, however, rarely wears out. For many years, fleet owners would remove the body from a worn chassis, refurbish it, and mount it on a new chassis, often as many as three times. Today, owners have found it more economical to sell older trucks in the burgeoning overseas markets. Trucks that are too old to be sold overseas are disassembled and the steel is sold as scrap. Most manufacturers use the Underwriters Laboratories (UL) Standards for ballistic resistance as a point of reference for the armoring and windows on their trucks. UL tests various materials for their ability to withstand fire from a variety of weapons and rates the materials from Class 1 to Class 4. Class 1 offers the lowest resistance (a shot from a large caliber handgun) and Class 4 offers the highest. The trucks them-selves are considered commercial vehicles and therefore must comply with standards set by the U.S. Department of Transportation. But most of the industry's quality control and design specifications are determined by what the insurance companies that underwrite armored carriers are willing to accept. The insurance underwriters determine acceptable armor levels, type and number of locks, and most stringently, operating procedures. The armored truck has always relied on a show of force for its security. It is a massive, locked steel box filled with armed guards. Aside from stronger and lighter alloys of steel and laminates of glass used in its construction, the basic design will likely remain the same. The increased and varied placement of automated teller machines (ATMs) has created a demand for trucks based on smaller chassises to haul lighter but more numerous cargoes. Increased use of global positioning satellite (GPS) systems, which allow a dispatcher to track the exact position of each truck, will create greater efficiency in routing the growing number of trucks and may act as an additional deterrent to potential hijackers. "Independent Armored Car Operators Association, Inc. Home Page." http://www.iacoa.com/ (June 22, 1997). "Streit Manufacturing—Custom Designed Armored Vehicles" http://www2.armored-vehicles.comlstreitl .